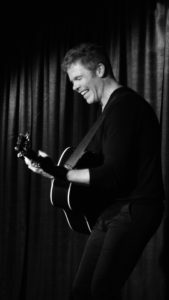 I was lucky enough to be invited to Josh Ritter’s acoustic show this past week at Rams Head On Stage in Annapolis. First off, Rams Head Annapolis is one of my FAVORITE venues to enjoy a show. It’s intimate..it gives off a jazz club vibe. And it’s the perfect place to take a significant other for a nice meal and some good music. I flew solo to this event, but was seated with two great peeps, Matt and Jessica, whom provided the picture of Josh above. Being honest here..I knew who Josh was, but hadn’t heard much of his music. Matt and Jessica filled me in on Josh, and their connection to him. They’ve been fans of his for years, and always come and see him play when they can. I was then ripped away from this great interaction, because the usher had seated me at the wrong table. Anywho, shortly after that awesomely embarrassing moment, Josh comes out to thunderous to the almost capacity room. He starts off with “In Your Arms Again.” It’s a great tune to start off with, especially if you’ve never seen him perform. It had a nice beat, and I even found my head bobbing back and forth. As the night went on, it became clear that Josh is a natural performer and great guitarist. The opening line gave me CHILLS. Haunting. Breathtaking. NOT ENOUGH ADJECTIVES. Seriously. Josh mesmerized me with that one entire performance. You could hear a pin drop in that place. He ALMOST got a standing ovation from me after he finished the song, but I would’ve looked so weird doing it haha. I had to do a double take. The crowd died. A mark of a great performer is a novice going into their show not knowing much of their music, and coming out having been immersed in their artistry. That IS the Josh Ritter experience, my friends!